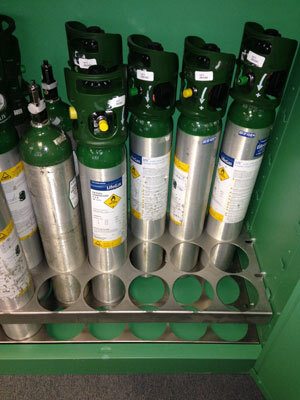 Store your portable medical gas cylinders safely and in compliance with OSHA requirements. 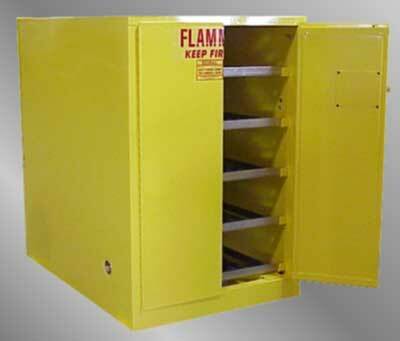 These lockable storage cabinets limit access to authorized personnel, protecting cylinders from theft, damage, or tampering. The heavy-gauge, double-walled construction shields your cylinders from heat, sparks and flame, and separates them from flammable and combustible materials. Designed for D- and E-size cylinders up to 33-3/4" long x 4 1/4" diameter. Storing Full, Partial & Empty Cylinders - Are you in compliance?? Improper storage of medical gas cylinders poses a number of hazards to patients and staff. The National Fire Protection Association's regulation NFPA 99-1999 section 4-3.5.2.2(b) mandates requirements for storing nonflammable gas cylinders. The Joint Commission requires compliance with the NFPA requirements under Environment of Care standards EC.02.06.01, EP 1 and EC.02.03.01, EP 1. Segregate cylinders: The Joint Commission requires organizations to segregate full, partial and empty cylinders by physically separating and clearly labeling the cylinders. Once a cylinder valve is opened, it is considered empty, even if gas remains in the cylinder. For storage purposes, any opened cylinders must be physically separated from full (unopened) cylinders. ELS Products offers separate product lines to store Full, Partial, and Empty Cylinders. 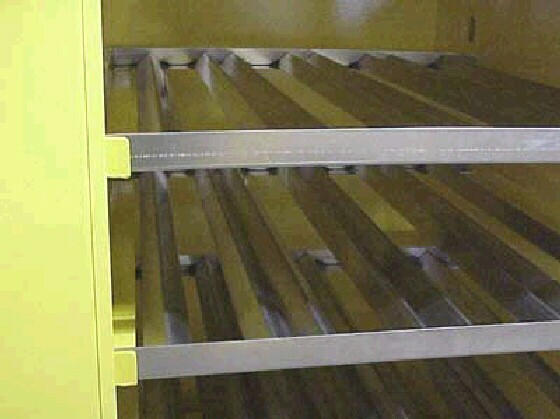 Optional adjustable divider is available to segregate cylinders for 9-12 and 21-24 cylinder storage cabinets. Click the above links for Design Specs, Features and Construction. Complies with OSHA regulations designed in accordance with specifications set forth by the National Fire Protection Association. MG-Divider-9 Adjustable Full, Partial & Empty Cylinder Divider for 9-12 D, E cylinder storage cabinet. MG-Divider-21 Adjustable Full, Partial & Empty Cylinder Divider for 21-24 D, E cylinder storage cabinet. - Storage for nonflammable gases greater than 3000 ft3 (85 m3) shall comply with 4-3.1.1.2 and 4-3.5.2.2. Storage locations shall be outdoors in an enclosure or within an enclosed interior space of noncombustible or limited-combustible construction, with doors (or gates outdoors) that can be secured against unauthorized entry. Cylinder and container storage locations shall meet 4-3.1.1.2(a)11e with respect to temperature limitations. Smoking, open flames, electric heating elements, and other sources of ignition shall be prohibited within storage locations and within 20ft (6.1) of outside storage locations.